After failing last week to push the amnesty plan towards a full vote in the U.S. Senate, Flake was once again blocked, this time by Sen. David Perdue (R-GA), while trying to move his expansive amnesty-for-minor border wall funding plan forward. Perdue — a pro-American immigration reformer who has co-authored the legal immigration-cutting RAISE Act with Sen. Tom Cotton (R-AR) — told The Hill he blocked Flake’s amnesty plan for approximately 3.5 million illegal aliens shielded from deportation by the President Obama-created Deferred Action for Childhood Arrivals (DACA) program because it did not include popular reductions to legal immigration. It’s my opinion that we should take that time right now and continue to work on the permanent DACA solution as well as the other legal immigration issues that we know are with reach rather than settling for a temporary solution. 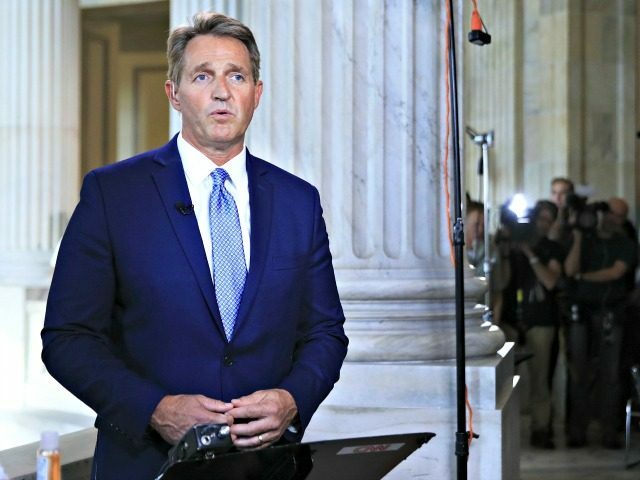 Flake’s plan would not include any of the illegal immigration reforms that the Trump administration has demanded, including provisions that would close legal loopholes to more swiftly and effectively stem illegal immigration at the border. Flake’s plan also does not include any reductions to legal immigration levels, as Trump as demanded. Those cuts to legal immigration are favored by American voters, as Breitbart News has reported. America’s working and middle class have suffered under decades of poor job growth, stagnant wages, and increased public costs to offset the importation of millions of low-skilled foreign nationals. Meanwhile, Trump is the first president in recent history to push Congress to reduce legal immigration to give relief to Americans. A reduction in immigration would potentially mean higher wages for American workers, who would see less competition with cheaper foreign workers and a less saturated labor market where there are more workers than there are U.S. jobs. Every year, the U.S. admits more than 1.5 foreign nationals, with the vast majority deriving from the process known as “chain migration” whereby newly naturalized citizens are allowed to bring an unlimited number of foreign relatives to the country. In 2016, the legal and illegal immigrant population reached a record high 44 million. By 2023, the Center for Immigration Studies estimates that the legal and illegal immigrant population of the U.S. will make up nearly 15 percent of the entire U.S. population.